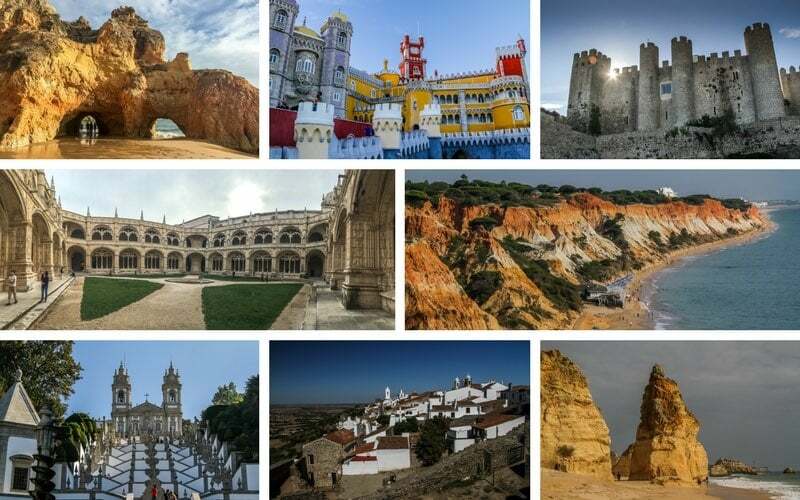 Let's define your Road Trip Portugal Itinerary - Gathered here are Information and tips to plan and prepare for your travel: best time to visit, driving tips and suggested Portugal itineraries for 7 days and 10 days or more. Make the most of your Portugal road trip! 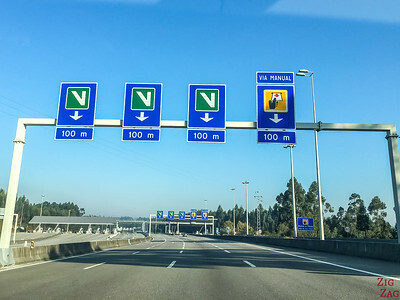 Let's start with some general information to start planning a Road Trip around Portugal. Driving - of course, Portugal is reachable by car from mainland Europe, but from anywhere except Spain it is quite a long drive! There can be quite a difference in temperature between the coast and inland as well as the North vs the South. There is a large offering of accommodations in Portugal. In Summer, you should book ahead as it fills up quickly especially in the Algarve. For Sintra, Lisbon and Porto you should book ahead all year round. And Below you will find several suggested Portugal itineraries with a mix of all those. Let's start with a classic: Doing a Lisbon to Porto Road Trip won't take you off the beaten track but you will see some of the best architecture the country has to offer. Visit another palaces or 2 in Sintra and if you want to scape the city, head to the coast with the cliffs at Cabo da Roca or the Splendid Magoito Beach. If you are up for it, wake up early an enjoy the atmosphere of Obidos at sunrise by walking on the all. Admire the white houses as the sun starts hitting them. Enjoy one of the most beautiful buildings in Portugal and a Unesco classified heritage site. The Batalha Monastery is quite impressive. Don't miss the unfinished chapels at the end! Leave Batalha and head North to the Main town in the Central Portugal Coimbra which used to be the medieval capital of Portugal for more than a century. Then leave the hussle and head out of the beaten path to find a location appreciated by the locals: the thermal region of Luso and its Bussaco Park. Enjoy the air, the trees, the fountains around the beautiful Bussaco palace. Head North and stop at Aveiro the Venise of Portugal. Maybe you can take a boat trip in the traditional boat or head to the beach and its colorful houses. Don't miss the St Vincent monastery with its Azulejos tiles and the Carmo Convent, remnant of the 18th century earthquake. Visit the many palaces of Sintra: Pena Palace, National Palace, Quinta da Regaleira and the ruins of the Castle of the Moors. Admire the architecture and explore the beautiful hilly parks. You can also drive towards the coast to admire the cliffs at the Westernmost point of Cabo da Roca and drive along the west coast to discover some of the beautiful beaches of the Nature Park. And Don't forget to bring binoculars to make the most of those views!!!! Check out my guide to find the best travel binoculars for your needs. Complete the loop of the 3 monasteries: Alcobaça, Batalha and Tomar Convent of Christ. All of them are fascination in their own way and provide a different experience. Most websites talk a lot about Batalha but I really enjoyed the atmosphere in the Convent. In Tomar spend some time in the city as well. A lot of history there! On the way you can also stop at the famous modern religious site of Fatima. Heard that the Algarve region is magical? Yes it is. So below is a suggested itinerary to head down to South Portugal and complete a West Algarve Road Trip in 7 days. Don't miss the St Vincent monastery with its Azulejos tiles and the Carmo Convent, remnant of the 18th century earthquake near the Santa Justa Lift. Drive South along the coast (do not take the Motorway). The Nature park is amazing with beautiful beaches such as Porto Covo, Odeceixe or praia da Arrifana. This is silply stunning and different from what you will see in the South coast of the Algarve. Head to the Southwesternmost point of Portugal at Cape St Vincent and admire the cliffs a the nearby Sagres fort. Some fo the best beaches in the Algarve are located near Lagos: Dona Ana and ​Camilo Beach. It is also the home of Ponta da Piedade, a promontory with caves arches and beautiful rock formations. A great pace to watch sunset! Portimao is a bigger city. But right there are some fantastic beaches such as Tres Castelos. Not far is also the double arch beach of Tres Irmaos and the adorable village of Ferrugado. Today you can discover what is known as one of the best beaches in the world: Praia da Marinha - vertiginous cliffs, arches and pinacles. Better to visit at Low tide. Other lesser known beaches around are also remarkable. Or you could visit one of the Port wine caves and enjoy a tasting. Visit the iconic Bom Jesus church near the town of Braga. It is famous for its grand staircase with perfect perspectives. Then you can head to the coast where the Sanctuary of Santa Luzia offers splendid views of Viana do Castelo and the sea. Head South through to the Northern Penada Geres National Park with the Lindoso castle. Explore the vineyards of the Douro Valley. Amazing views all along especially where the river is bending a lot. Spend the night at one of the vineyards and enjoy the local port wine. Drive North and stop at Tomar to learn about the kniwght templars. Visit the town and get uphill to explore the Convent of the Christ. This is quite a big place so take your time! Head North East to Serra de Estrela. This mountainous park has the highest points in mainland Portugal. Manteigas is the main town but here is much to see such as the Linhares Castle, the Zezere Valley and the strange formations at Senhora da Boa Estrela. This is also a hiking paradise if you are up to it. Head South to visit Castelo Branco and its beautiful gardens, before heading to the unique village of Monsanto. It has been named the most Portuguese of the Portugal villages, and yet it does not look like any other village in the country. No white houses here. The hill is covered with huge boulders and the houses have been been around, above and even under them. Plan enough time to really explore and admire the architecture as well as climb to what remains of the castle. Net stop : the nature park of South Mamede. It is home to beautiful hills and the Famous Marvao Village. Perched on a hill, its fortification walls offer magnificent views over the whole region. Someday you can see very far away! A little bit more South you can visit the palace at Vica Vicosa. And then you can head to another inspiring village near the Spanish Border: Monsaraz. This one is also perched on top a hill with fortification, a castle and white houses. Yet the atmosphere is completely different from the others. Plus the views of the Barrage lake ​are mesmerizing. Come back to Lisbon via the city of Evora - discover its many sites and maybe visit the Chapel of Bones. There is so many possibilities it is hard to give you a 2 weeks in Portugal itinerary. You can play with combination of the 7 and 10 days itinerary above. To really get a good view of all regions (except the islands) you have to plan 3 weeks. My eBook: The Road Trip Guide Portugal, can help you organize a tour that really fit what you like. With the preselected scenic attractions in each region and the maps localizing them, you can choose where to stop and build your own perfect road trip itinerary. Continue exploring Lisbon. So much to see and experience! Meals are really big portions! Nothing very specific to Portugal to pack. Head to my Travel Checklists article to get ready for your trip. Are you inspired to plan your road trip? Sorry but I am not a travel agent.